Stretch out: Calleigh Fangmeyer, athletic trainer, helps cadet P.J. Bourden with proper stretching techniques. Bourden is a junior from Garnet Valley, Pennsylvania, majoring in mining engineering and serving in Naval ROTC-Marine Option. Physical fitness is a big part of cadets’ daily lives. Calleigh Fangmeyer’s job is to help keep them training at their best. Fangmeyer, a certified athletic trainer employed by Carilion Clinic, joined the Virginia Tech Corps of Cadets staff in fall 2016. Her position is a first for the corps. “We are delighted to have Calleigh as a partner with our team. 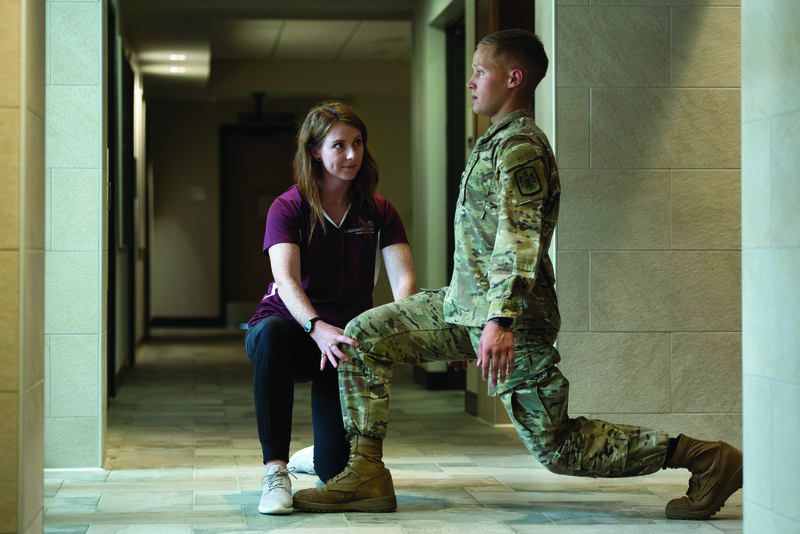 Because of the military’s emphasis on lifelong wellness, having her here to educate our cadets about the best ways to train properly and avoid injury will benefit them for decades to come,” said Maj. Gen. Randal Fullhart, commandant of cadets. Fangmeyer works with the corps as part of Carilion’s sports medicine program. She provides consulting and assistance to cadets, works with the cadet EMT group, and provides advice to the corps and ROTC staffs. Cadets seeking a military career must be able to perform at the physical standards set by their respective branches. In addition, all cadets attend group workouts a few times a week, practice military drill, train on the corps’ obstacle course, and participate in two 13-mile Caldwell Marches. Fangmeyer attends those activities, making sure cadets are training safely and addressing any injuries that arise. Fangmeyer keeps an office in New Cadet Hall, making it easy for cadets to see her. “More cadets are willing to seek help because it is not so far away, and they know that they will be educated on how to recover more efficiently,” Demyanovich said. Fangmeyer earned her bachelor of science in athletic training from James Madison University in 2014 and completed her athletic training graduate assistantship at Harvard University, in conjunction with her master of education from Boston University, in 2016. Shay Barnhart is the corps' communications director.